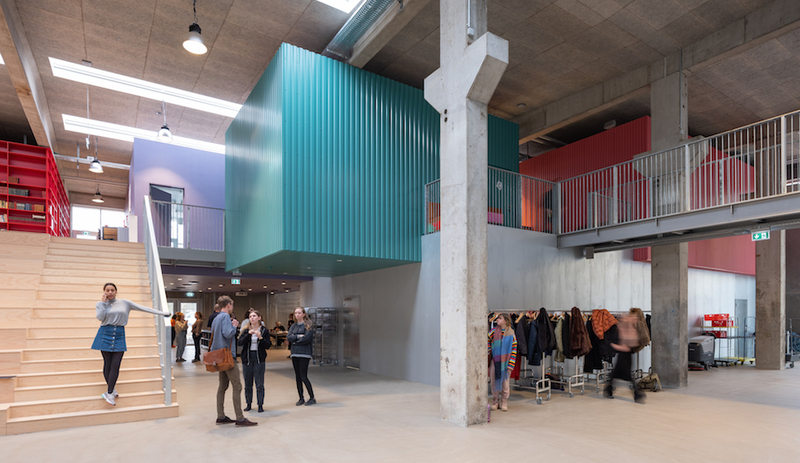 The building’s brutish exterior conceals surprisingly gracious interiors. 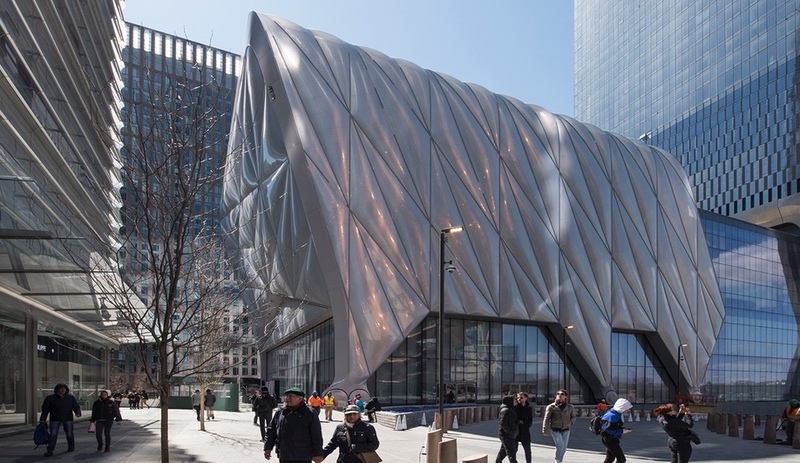 In an age of signature museum buildings that resemble large-scale sculptures, the new Whitney Museum of American Art is an anomaly. 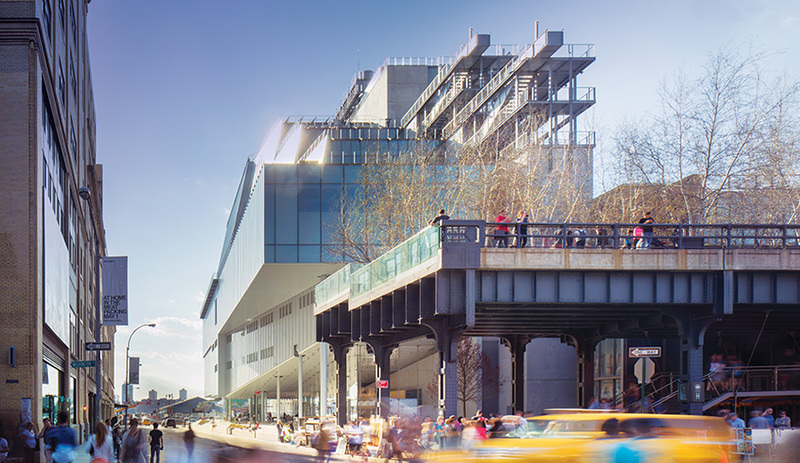 Designed by Renzo Piano, it rises as a hulking mass at the southern tip of the bustling High Line Park, where Manhattan’s Meatpacking District meets the Hudson River. From the outside, it’s no jewel. The 20,500-square-metre, nine-storey structure, which cost US$422 million, has been compared to a hospital, a factory, a power plant and an ocean-going freighter. 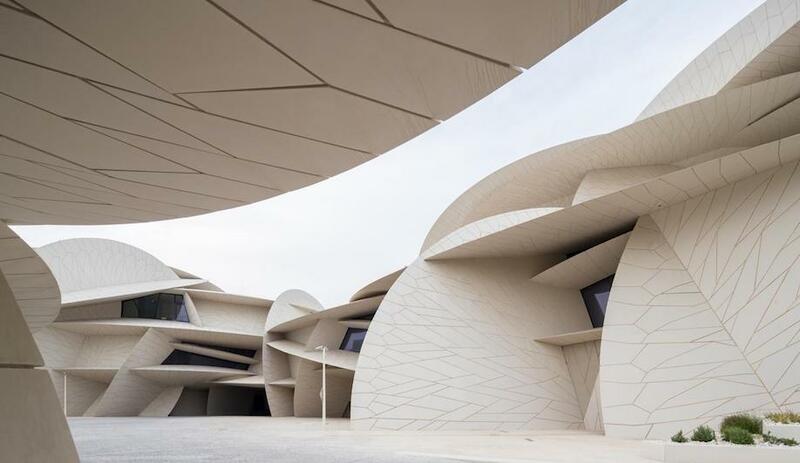 The museum contains over 15,000 square metres of indoor gallery space. Sliding partitions create more intimate exhibition rooms. But stepping inside feels like cracking open a geode, as the tough exterior gives way to a welcoming environment of unexpected beauty. When you approach from Gansevoort Street, as most visitors will, the base of the building peels upward to reveal an expansive glass-walled lobby. From there, four elevators – with interiors by artist Richard Artschwager – and an intimate winding staircase lead to the column-free main galleries, starting on the fifth floor. Levels 5 through 8 each have outdoor sculpture terraces overlooking the High Line, holdout meat­­packing operations, and skyscrapers to the northeast, bringing the museum into close conversation with its surroundings. 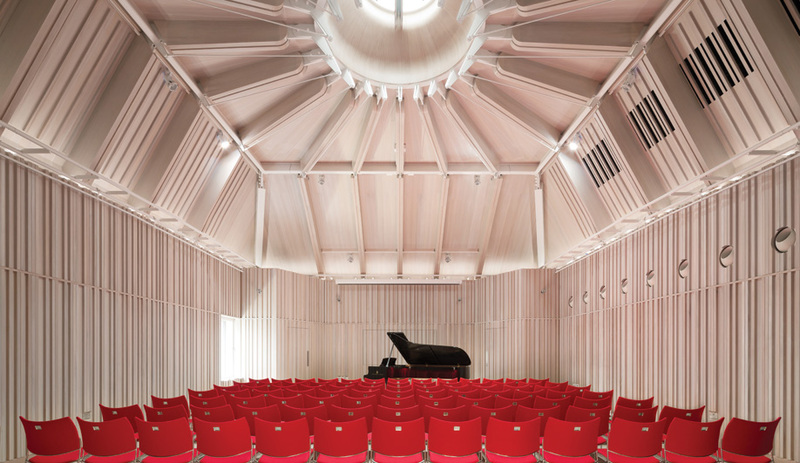 Over the years, Piano has proven adept at buildings of all scales and styles: sculptural icons like the California Academy of Sciences in San Fran­cisco; surgical expansions at sensitive architectural sites, like Le Corbusier’s Notre Dame de Haut chapel in Ronchamp, France; and ­industrial-inspired structures like the Centre Pompidou in Paris. 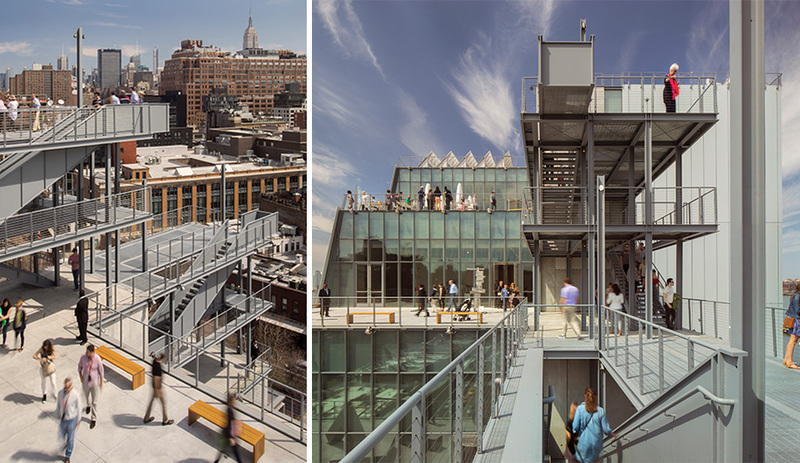 The Whitney, with its imposing exterior of grey-blue metal panels, glass and concrete, clearly channels the latter. It also pays respect to the museum’s former home on Manhattan’s Upper East Side – a brutalist, granite-clad behemoth designed in 1966 by Marcel Breuer, which shocked many of its neighbours at the time but has since been acknowledged as a masterpiece. 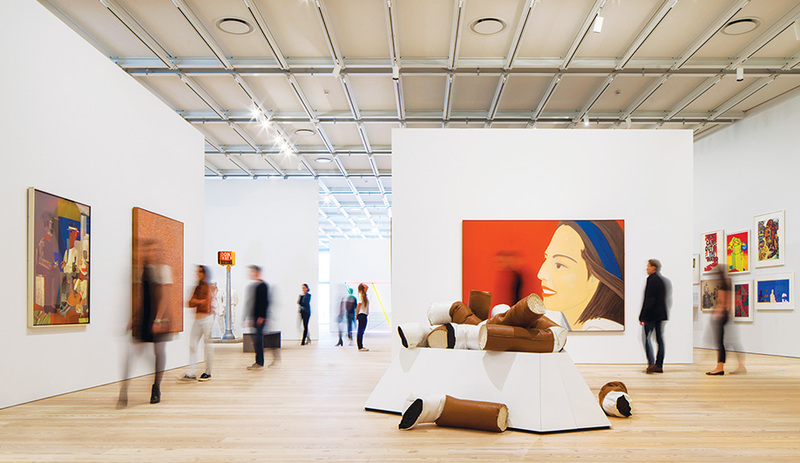 The Whitney moved to its new site after 20 years of ill-fated expansion proposals (it is now leased to the Metropolitan Museum of Art).